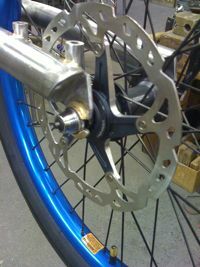 Will Meyers of Davidson Bicycles has been working to modify my BMX fork to accept a disc brake. The fork is a Drive Lite Fork from Drive BMX, which is pretty light among 20” forks, yet is designed for street (as in trick riding) rather than racing. 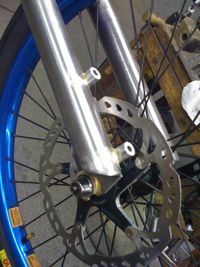 Will started off fabricating a post mount for the Shimano cable-actuated caliper, and then he improvised some “lawyer tabs” for the dropouts, reducing the chance that the axle could be dislodged by the counterforce of the disc. The frame is still waiting for the final welding process. Maybe some time in the next couple weeks. My bike isn’t a priority since the shop isn’t making a profit on it, so I have plenty of time to obsess over the paint scheme.